Prominent Chinese human rights lawyer Gao Zhisheng, missing for more than a year after being detained by police, has spoken to Western journalists. He said he was living near Wutai mountain, a Buddhist landmark in northern Shanxi province. "I want to live a quiet life for a while," Mr Gao said by phone. The BBC's Michael Bristow in Beijing says there are still many questions about Mr Gao's situation and the latest news only serves to deepen the mystery. The lawyer told Reuters news agency he had been released six months ago. He was abducted by police from a relative's house in February 2009. He has spoken by telephone to his two children, who along with his wife sought political asylum in the US last year, by phone. They are "thrilled and relieved" that he is alive. 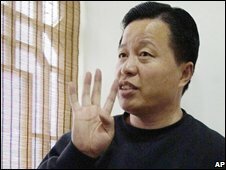 2006: given suspended prison sentence for "inciting subversion"
Reuters said it had taken steps to verify Mr Gao's identity. Another human rights lawyer, Li Heping, said he had also spoken briefly to Mr Gao on Sunday. His disappearance has sparked international concern, with calls from the US, the UK and the European Union for China to investigate his disappearance. "Most people belong with family, I have not been with mine for a long time. This is a mistake and I want to correct this mistake," Mr Gao told the Associated Press news agency. Mr Gao told AP he was not allowed to accept media interviews. Friend and fellow lawyer Mr Li told the BBC that Mr Gao had not seemed at ease to explain himself, say where he was exactly or when he would be able to contact family and friends in the future. Mr Gao, a self-taught lawyer, was once a member of the Chinese Communist Party. In 2001 he was acclaimed as one of the 10 best lawyers in the country by a publication run by the Ministry of Justice. But he ran into trouble when he started to defend some of China's most disadvantaged groups, such as supporters of the banned spiritual movement, Falun Gong. Mr Gao's law practice was closed down in 2005. The government said one problem was that the lawyer had failed to tell officials of a change of address. The following year he was given a suspended prison sentence for "inciting subversion". He has previously said he had been tortured while in detention.